Even an overcast morning with a few sprinkles did not keep the 58 registered auto buffs from bringing their vintage wheels to Morley Park last Saturday, July 27, according to Cedar Springs Historical Museum Director Sharon Jett. 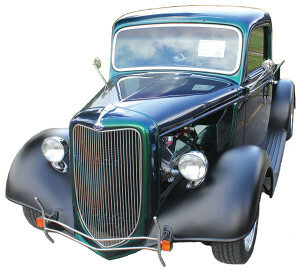 The annual car show each summer is one of the museum’s biggest fundraisers. Historical Society President Fred Gunnell, welcomed me to the show and Sally Grayvold wanted to make sure I got my name in the bucket for the 50/50 drawing, which was won by Darwin Spear of Grand Haven. There was a good mix of vehicles to look at as you walked the line. Some looked mint-out-of-the-box such as Phil Harrison’s 1957 Chevy, while others were works in progress. There were sports cars, family sedans and pickup trucks. Some were stock and others were modified like Gene Nielsen’s 1935 Ford pickup he had been working on for the last 3-1/2 years. Carl Anderson had it in his barn for a number of years before Gene picked it up and started work on it. One gentleman had a pair of 1940’s era military jeeps. One painted Army olive drab with a pedestal mount machine gun and the other in Air Force blue. Both had trailers and were in better shape than my jeep was in the 101st Airborne Division back in the 1970s. Music by the Patin Sisters, Pat and RoseAnne, drifted through the air along with the aroma of grilled hot dogs provided by the Cedar Springs FFA. A big thank you to all the sponsors who helped make the fundraiser a success! Rotary District 6290 is looking for young business professions between the ages of 25 and 40 who are interested in traveling to Bangladesh on a vocational exchange. While there, they will interact with other professionals in their fields, learn about the culture, and experience the way of life of the Bangladeshis. Other than personal expenses, all costs are covered by The Rotary Foundation.